Using E-Spire Retail meant that with our extensive Project Management, proficient and friendly merchandising teams the stores could concentrate on their day to day tasks. After an initial introduction with store and colleagues our teams worked un-aided. Layouts were implemented to plan and changes made in a clean and tidy work area and whilst assisting customers and staff changes were carried out safely during the trading day. Final signoff with multiple images and robust handover concluded every store. Following the Homebase Lighting Review, E-Spire Retail were further asked to support another review in-store, The Light Bulb Review. E-Spire Retail were tasked to re-merchandise the footages in Stores across the UK. A large number of New Light Bulb ranges and packaging were introduced to compliment amongst others the newly installed lighting ranges. 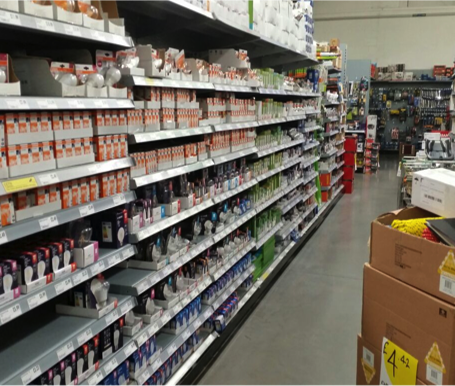 E-Spire Retail supplied professional Retail Merchandising Teams to implement the new BULB planogram changes, adding in new lines whilst systematically organising overs and discontinued products. In total 145 stores were re-merchandised over a three week period ensuring all products were displayed to plan, stock was rotated for new packaging and throughout a high standard of compliance and cleanliness was achieved. E-Spire Retail provided full reporting and managed the merchandising plans for E-Spire Retail teams at respective stores. E-Spire Retail completed the works within the 3 weeks allocated for the review and within budget providing daily feedback and support to stores and the Homebase Project Team.